Go to the Heart of Jesus and draw from it, and when you need more, go back to the Source and draw again. Time and again, as I read things written by Sophie, I come across these words - go... draw - in relation to the Heart of Jesus. In the 1815 Constitutions, for example, the novices were to go to the Heart of Jesus to draw from it a love of charity or poverty. Elsewhere, whether in conferences or personal letters, the same advice; the same words - go, draw, source. Maybe today, as we celebrate her feast, Sophie is urging us to return to our Source, and to keep returning; to draw whatever we need, time and again, confident that here is a spring which will never dry up! She herself tells us, in the Constitutions she wrote, that we are certain to find in the Heart of Jesus an inexhaustible source of strength, grace and consolation. And elsewhere, she assures her sisters that the Heart of Jesus is open for us... let us go to him to draw the strength and the courage we need. And a happy feast to you all! *I know that in many parts of the world people still rely on wells and pumps, but my own closest experience to any of this was the hand-pump in my family home in Piemonte. 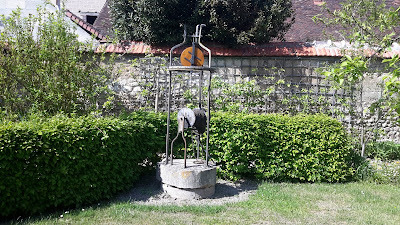 It was one of the last remaining in the village, fed from a fresh, clear-tasting spring: but by my time la pompa was an optional extra, besides which, a bit of pumping was energetic fun for a child accustomed to taps.